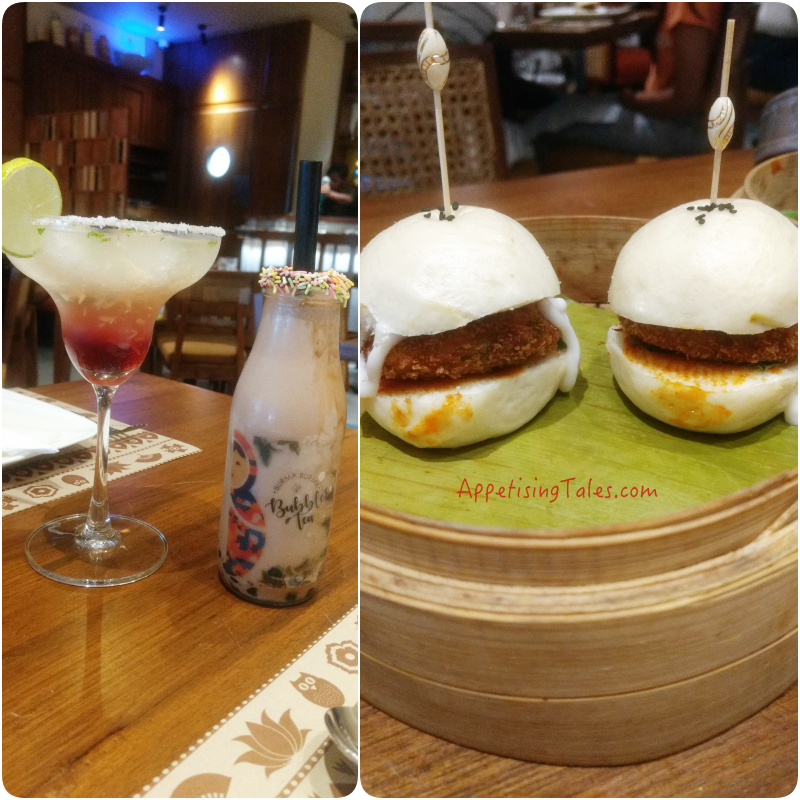 Appetising Tales: The Deliciousness of Burma Burma has reached South Delhi! 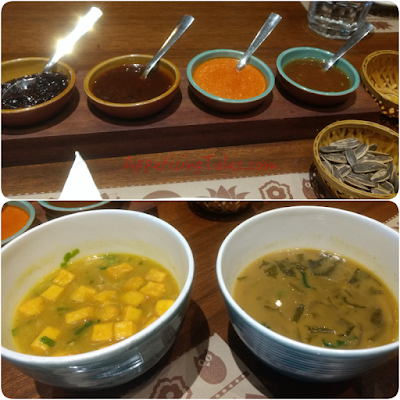 The Deliciousness of Burma Burma has reached South Delhi! Burmese food abounds with a mélange of flavours and textures. Fresh, raw ingredients are combined with fried, crunchy bits; most dishes offer a delicious balance of salty, sour and even a hint of sweet; and different regions of Myanmar are characterized with distinct dishes. 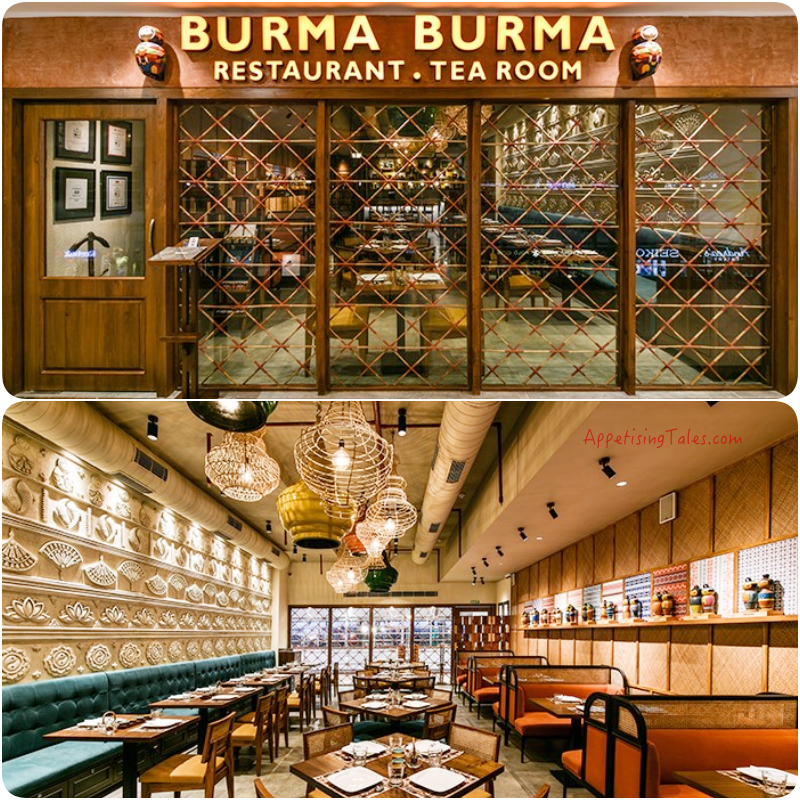 At the newest outpost of Burma Burma, at Select City Walk, Saket, the menu and décor reflects a celebration of Burmese tribes. The interior highlights symbols, fabrics and artefacts of 8 Burmese tribes. The spacious restaurant, situated on the second floor of the mall, highlights various elements from Burmese culture. One wall showcases the eight most popular tribes of Myanmar, through various textile patterns unique to each tribe along with a wooden doll dedicated to the tribe. The opposite wall is adorned with auspicious symbols - lotus flower, owl, fish, etc. And in the center hangs a beautiful collection of lanterns, lending light and positivity to the space. At the far end lies the tea bar, one that you will find at each Burma Burma outlet, because of the sheer variety of tea that you’ll get to sample here. Top: Nibble on Sunflower seeds to whet your appetite. Bottom: Chickpea Tohu Soup; Roselle Leaves Soup. I think the success of Burma Burma lies in serving food that is comforting yet exciting to the palate. Comfort food is normally associated with familiar dishes, often those that evoke some nostalgia. But here, soups like the Chickpea Tohu Hincho and Tangy Roselle Leaves Soup are delicious and warming, although with flavours that I have never tasted before. The Samosa Soup that I had tried on my last visit offers an unusual way of having a samosa – dunked in a tangy soup made with cabbage, carrot and capsicum. Steamed Buns too hit the spot with their freshly baked bao-like texture and sweetness. 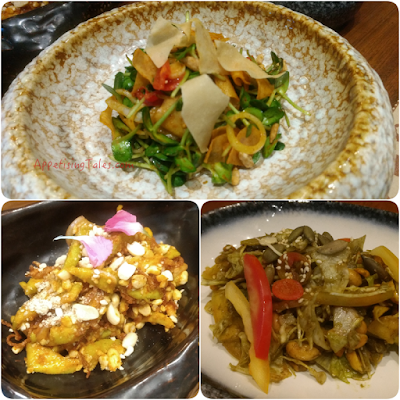 While most people will like the familiarity of a simple brown onion and roasted chilly filling (Rs 330), the crunchy tofu (Rs 370) and crispy vegan mock meat (Rs 370) are fabulous new additions to the menu. Bottom: Guava Salad; Tea Leaf Salad. Another key to Burma Burma’s success is the consistency of food. We have all heard of many restaurants that start with a bang and then disappear into oblivion, if not shut down, after the initial hype settles down. But Burma Burma continues to go strong – right from its first outpost in Mumbai to the latest one in Delhi and another one opening in Bangalore by the end of January 2018. Even after a year and a half of existence in Cyber Hub, one often finds a queue waiting to get a table. And I am happy to note that some of the dishes that I had eaten at the Cyber Hub outlet taste exactly the same at the Saket one. These include the fantastic salads – the popular Tea Leaf Salad (Rs 360) comes with boiled peanuts and corn mixed with tea-leaf paste, green chillies and raw papaya. In the Sunflower Leaf salad the said leaves come as crunchy microgreens, topped with soy chips, onion rings, red chillies in a spicy, tangy dressing. The seasonal special is the Guava Salad (Rs 370), crushed peanuts, red chillies and brown onions. I would suggest you go for the salad sampler (Rs 520) that has three exotic salads. Left: Refreshing Spiced Ginger, Nutella Bubble Tea. Right: Crunchy Tofu Steamed Bun. By now, I’m sure, you’ve got an idea of the fabulous flavours that you can get to taste here. But at the heart of all that deliciousness lies food that is nutritious too. 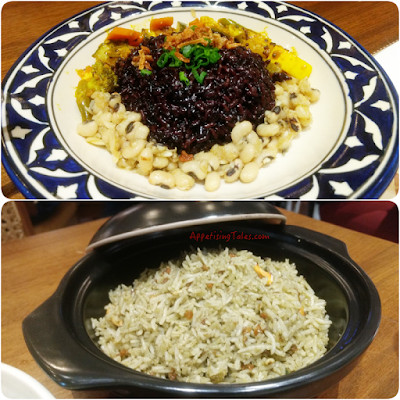 The Black Glutinous Sticky Rice with black-eyed peas and pickled veggies (Rs 390) is a complete meal in a bowl. The black rice comes with many health benefits plus the protein from the peas and goodness of fermentation from the pickled vegetables shows how nutritionally balanced most traditional cuisines tend to be. Ankit Gupta, one of the partners behind Burma Burma, shares how the team travels regularly to Myanmar, trying an array of dishes (and this time, plenty of tribal fare) and got family-owned recipes to replicate in the restaurant. Only at times, some exotic ingredients are used to enhance the appeal of some dishes. Bottom: Burmese Fried Rice with tea-leaf paste. 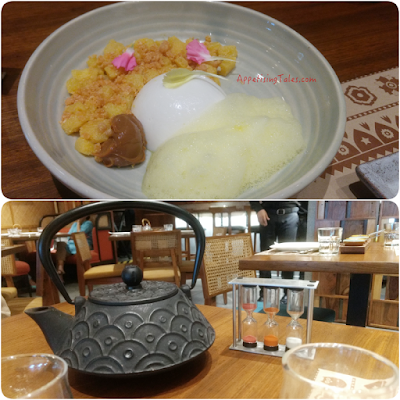 While you will find traditional Burmese desserts like Tagu Pyian, sago cooked with palm jaggery, and the popular durian icecream, it’s the non-Burmese desserts that I would recommend including the Chocolate Caramel Dome (that comes from Bombaykery along with some other sinful delights). But the one that I’d most certainly go back for is coconut custard with candied pineapple, a little bit of pineapple foam and a dollop of nutella - the very first bite of which transported me to a tropical paradise! Top: Candied Pineapple with Coconut Custard and Nutella. Bottom: A comforting pot of Burmese tea. PS: Have I mentioned that this is a vegetarian restaurant and they don't serve alcohol? You see, one forgets! Burma Burma, Second Floor, Select CityWalk Mall, Saket, New Delhi. Timings: 12 noon – 11pm.